While fantastical stories have been with us as long as we’ve been human, in the early 1800s a new type of story appeared. Often Mary Shelly’s Frankenstein is named as the first example of this genre. Also known as The Modern Prometheus, it gives us the tale of a mad scientist who creates a creature from alchemy and science. By the late 1800s H. G. Wells wrote tales of The Time Machine, and an alien invasion with The War of the Worlds, and Jules Verne gave us adventure stories of an atomic powered submarine in 20,000 Leagues Under the Sea, and the first astronauts in From the Earth to the Moon. 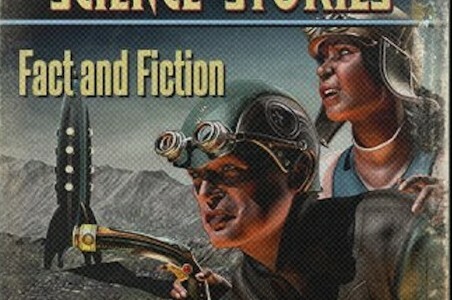 It’s not surprising that the earliest works of science fiction were about time travel, space aliens and starships. We love dreaming of new horizons, and science fiction can create entire tales from the the mere whiff of scientific possibility. This can be both a blessing and a curse. On the one hand science fiction lets us explore the possibilities, and can inspire an interest in science. On the other hand, the trappings of science fiction can make awesome feats of human engineering seem trivial. Who cares if we can land a rover on Mars when science fiction lets us travel to the stars. On the gripping hand, many of the concepts of science fiction are now deeply rooted in our culture. The once futuristic idea of touch screens and verbally asking your shipboard computer for information on a particular star system are now very real. Even some of science fiction’s wildest ideas like teleportation and quantum computers are at the cutting edge of real science. But some common ideas from science fiction are based only on the most tenuous science. While we all know what time machines, warp drive and wormholes are in the context of science fiction, scientifically these ideas are speculative at best. They also happen to show up all the time in popular science articles. You’ve likely come across the “NASA working on warp drive” articles, or “scientist wants to build time machine”. Popular media often portrays them as merely engineering challenges rather than speculative science. They are also ideas I get asked about all the time. I’ll focus on what we know both experimentally and theoretically. We’ll go to the very edge of current science, but separate scientific possibility from wild fantasy. Starting tomorrow: Time travel. Is it really possible to go back in time? If your Mom falls in love with Calvin Klein instead of your Dad, does that mean you’ll cease to exist? Allons-y! No, but it does mean that you’ll be dressed better. “Jules Verne gave us adventure stories of an atomic powered submarine in 20,000 Leagues Under the Sea” – electric powered, to be honest. They charge it using set of galvanic pairs.